Here’s a flip phone that could put the “cool” back into clam shells. When a phone call or an email comes to you, “bio” informs you by lifting the edge of its cover. And if you touch it lightly, the cover automatically opens to “B” position. Its movement is not strong, but it helps your action gently. The cover is made of elastomer that is inserted with actuators like artificial muscles. 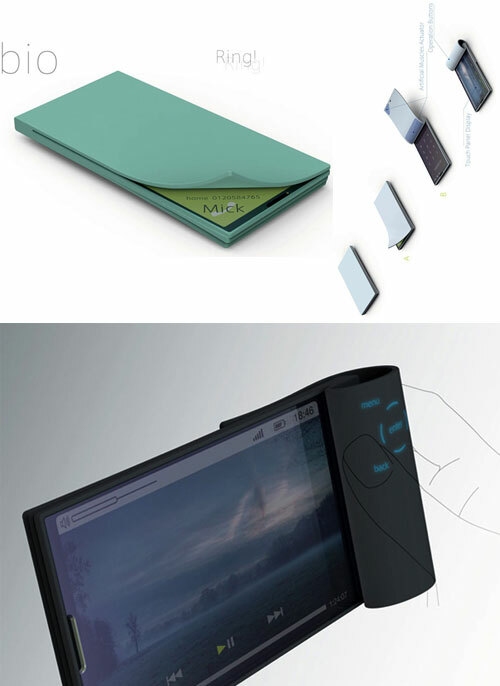 When you enjoy web browsing or movies, the cover is turned to the backside, like a magazine held by one hand. You can hold “bio” tight with the rounded cover as a grap and operate it with buttons that appear on the cover. Looks like a smooth pebble but for the ultimate web browsing experience, the rear has a soft-gel-like grab extension that can pulled out. It fits snugly in one hand and has built-in controls to pinch and squeeze your way through the internet with simulated buttons for scrolling and moving back/forth through pages. It features route navigation, word recognition and object identification, which are displayed as braille on a silicon screen or transmitted as audio cues via the detachable blue tooth headset. 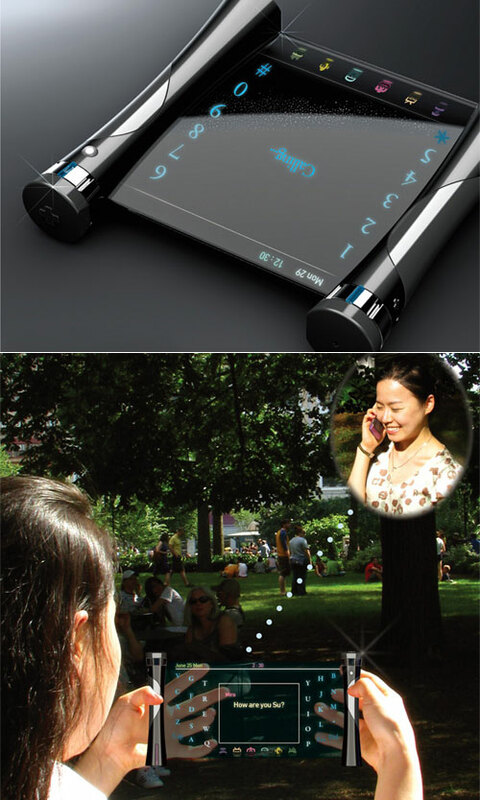 Although smart phone applications & braille cell phones do exists, a full-fledged concept like this is a ways away. 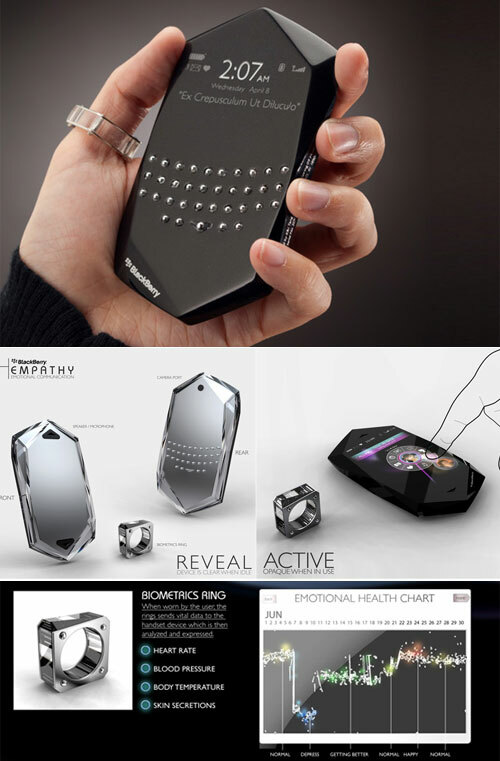 The phone is used in conjunction with a biometrics ring that is worn by the user to collect “emotional data”. 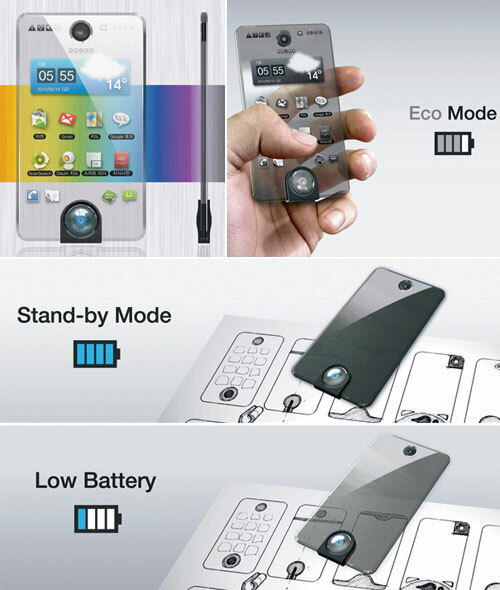 Spec-wise it features a transparent OLED screen that becomes transparent when not in use and opaque during interaction. The front is all touch surface, while on the back there is a physical keyboard. It is touch based and all the user’s connections are shown graphically so you can see who is connected to whom. Each contact has an avatar that is encompassed by two colored rings. The inner colored ring shows the contact’s previous emotional state, and the outer ring represents the contact’s current emotional state. It is important to show the shift in emotions in order to see how an event has affected that contact. Another important feature that was the “Emotional Health Chart”. This chart would monitor the user’s emotional health through an indefinite period of time. Sony Ericsson FH Mobile Phone has a pivotal point to it. 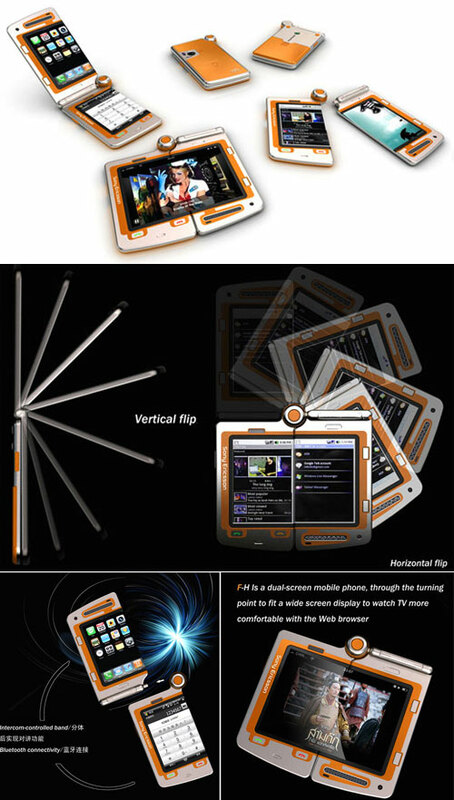 It flips vertical on a pivot to mimic a phone and rotates sideways to become a viewing screen for the media functions and web browsing. The phone even becomes an intercom of sorts when split into two, allowing easy communication between the two parties holding each end. 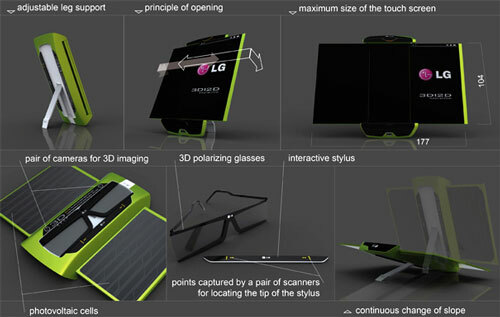 Focusing on the use of 3D in cellphones, Petr Kubik has designed this all-in-one-piece that includes the glasses, intuitive stylus and expandable screens. The 3D apps support 3D movies and camera plus allow you to make surreal calls with family and friends that pop outta the screen! Pratt student Suhyun Kim is quite concerned about the deaf folks and wants them to enjoy technology as much as we do. Her Visual Sound is a mobile phone for the hearing impaired that converts voice input to text and text input to voice. The design features two handy pillars that scroll sideways to expose the roll-out display. To communicate, the impaired person feeds in the text onto the touchscreen display, which gets converted to voice simulation for the person on the other end of the phone and vice verse. Big screen consists of 2 layers: a soft OLDE – touchscreen and soft nano material hardening in the filing of low-voltage nego. At the time opening screen hard and bouncy, after work on the side of the screen is pressed Eject, and becomes soft and mosey inside. 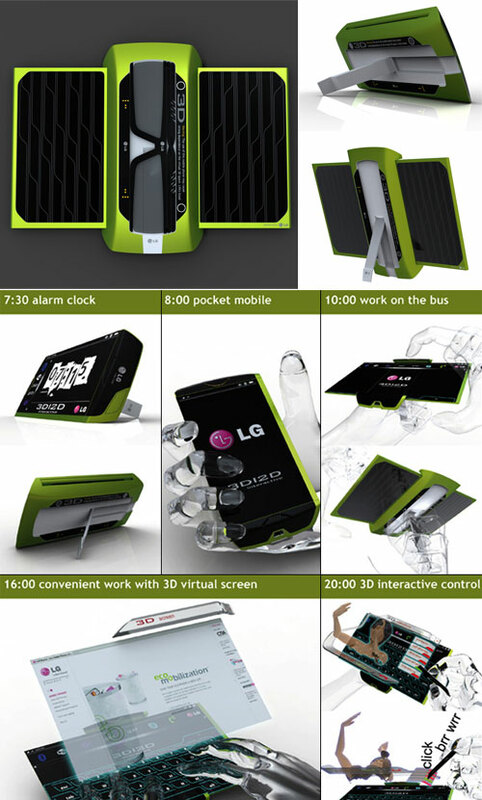 The “Mobile Script” mobile phone does not require a power charge, its case is covered with a nano material, converting the Sun light into the energy for your phone feed. At your phone’s display you can watch how much charge is left at the battery and how strong the power of the light which charges the battery is. 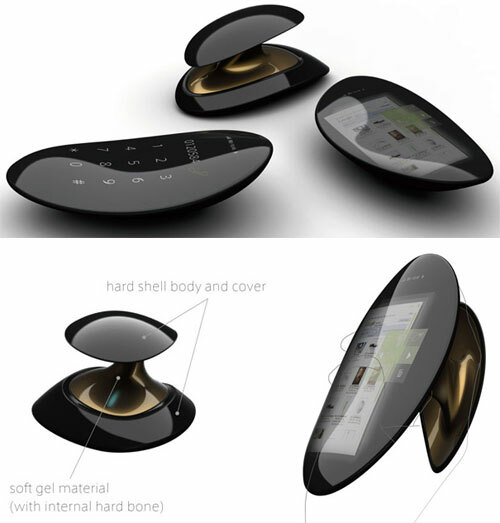 The Window Phone is a concept mobile phone that is able to transform its appearance like a window as per the weather. 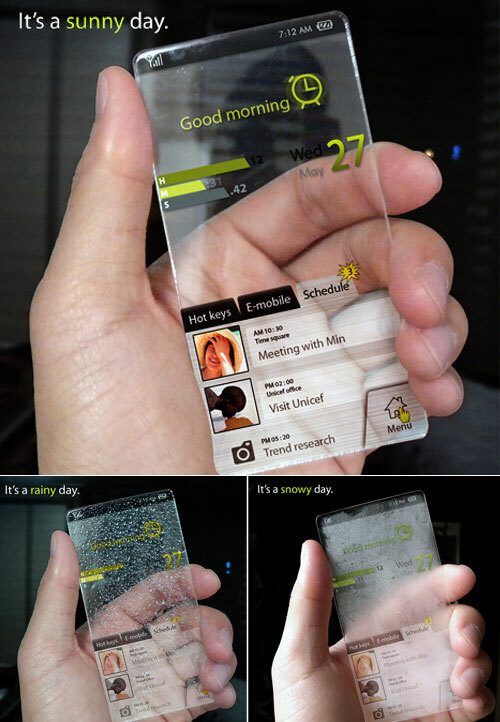 The phone is designed as a thin, clear and transparent plastic sheet, which remains clear during a sunny day, becomes humid during a rainy day and takes a dump outlook during a snowy day. 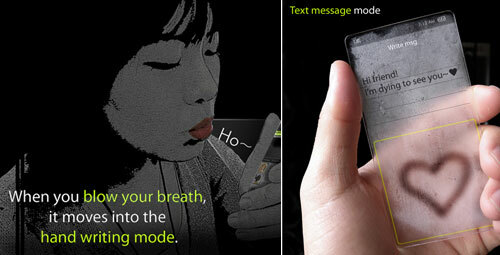 The user can write text messages or draw pictures on the phone in different weather conditions which will later transform and show as SMS characters. The screen features sensitive interaction with the user and comprises the state of a window in different weather conditions. 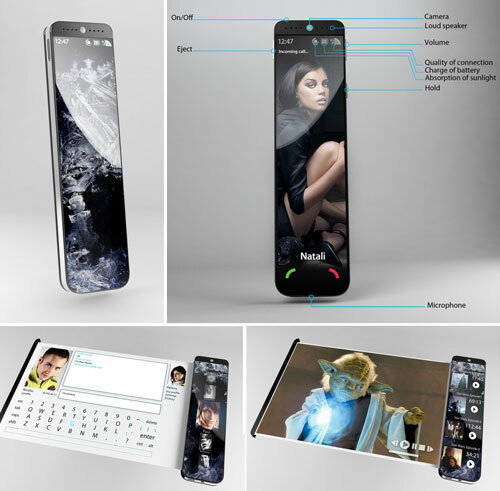 Ambitious designer Samuel Lee Kwon’s concept design of the iPhone shows just what the folks expect out of Apple products in the future. 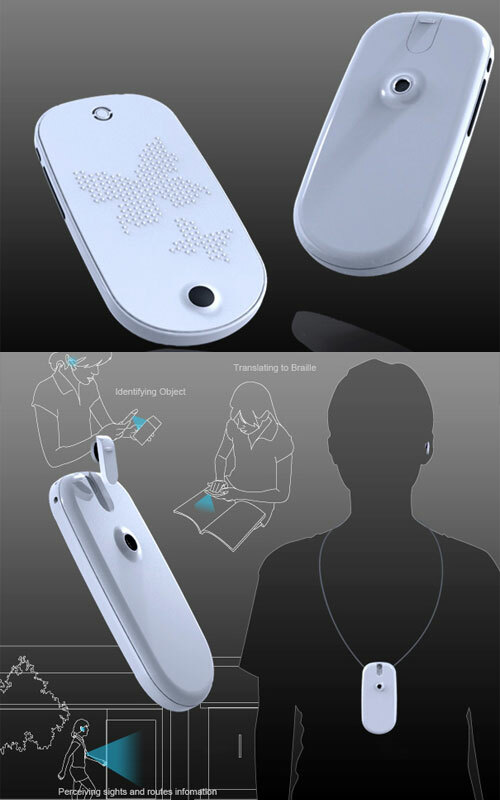 Samuel’s concept iPhone comprises of a small wrist worn projector that has a few icons of its own. When you click on the respective icons, the main body of the phone gets projected on your palm. Yes, it’s that cool! 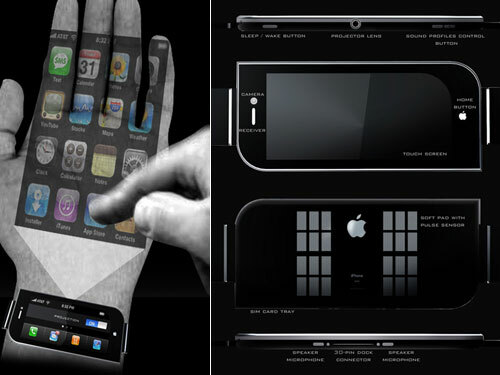 Turning your palm into a touchscreen, you then start interacting with your phone.